Learn how to create Apache Spark cluster in Azure HDInsight, and how to run Spark SQL queries against Hive tables. Apache Spark enables fast data analytics and cluster computing using in-memory processing. For information on Spark on HDInsight, see Overview: Apache Spark on Azure HDInsight. In this quickstart, you use the Azure portal to create an HDInsight Spark cluster. The cluster uses Azure Storage Blobs as the cluster storage. For more information on using Data Lake Storage Gen2, see Quickstart: Set up clusters in HDInsight. Billing for HDInsight clusters is prorated per minute, whether you are using them or not. Be sure to delete your cluster after you have finished using it. For more information, see the Clean up resources section of this article. Cluster name Give a name to your HDInsight Spark cluster. The cluster name used for this quickstart is myspark20180403. Subscription From the drop-down, select an Azure subscription used for this cluster. The subscription used for this quickstart is <Azure subscription. Cluster type Expand the item, and then select Spark as the cluster type, and specify the Spark cluster version. Cluster login username Enter the cluster login username. The default name is admin. You use this account to login in to the Jupyter notebook later in the quickstart. Cluster login password Enter the cluster login password. Secure Shell (SSH) username Enter the SSH username. The SSH username used for this quickstart is sshuser. By default, this account shares the same password as the Cluster Login username account. Resource group Specify whether you want to create a new resource group or use an existing one. A resource group is a container that holds related resources for an Azure solution. The resource group name used for this quickstart is myspark20180403rg. Location Select a location for the resource group. The template uses this location for creating the cluster as well as for the default cluster storage. The location used for this quickstart is East US 2. Select Next to continue to the Storage page. Select a Storage account: select Create new, and then give a name to the new storage account. 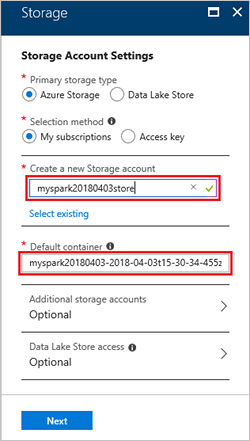 The storage account name used for this quickstart is myspark20180403store. On the screenshot, it shows Select existing. The link toggles between Create new and Select existing. The Default container has a default name. You can change the name if you want. Select Next to continue to the Summary page. On Summary, select Create. It takes about 20 minutes to create the cluster. The cluster must be created before you can proceed to the next session. If you run into an issue with creating HDInsight clusters, it could be that you do not have the right permissions to do so. For more information, see Access control requirements. Jupyter Notebook is an interactive notebook environment that supports various programming languages. The notebook allows you to interact with your data, combine code with markdown text and perform simple visualizations. 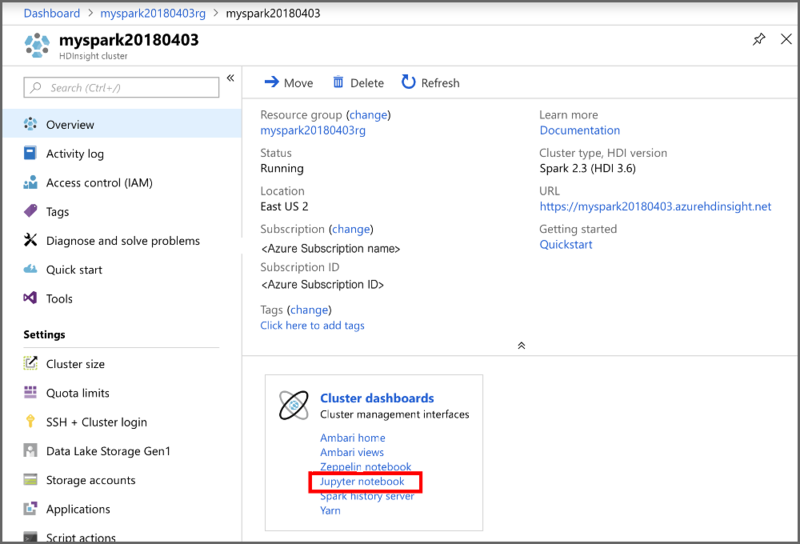 Select HDInsight clusters, and then select the cluster you created. 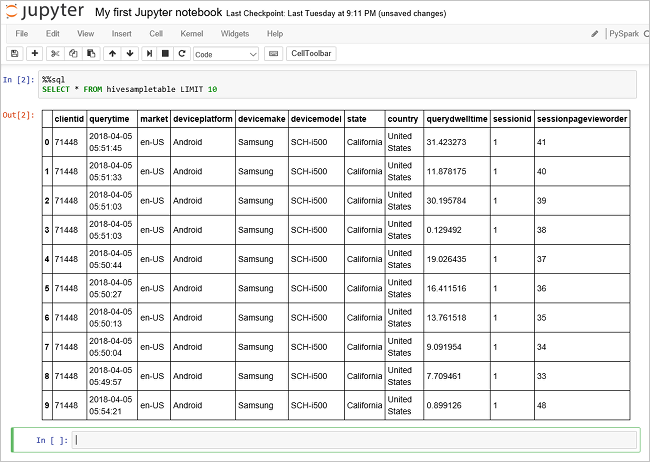 From the portal, select Cluster dashboards, and then select Jupyter Notebook. If prompted, enter the cluster login credentials for the cluster. 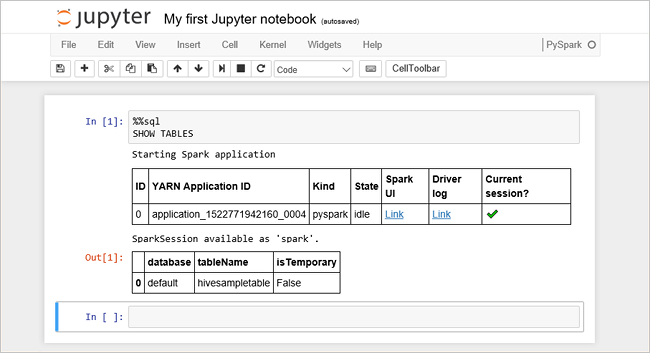 Select New > PySpark to create a notebook. A new notebook is created and opened with the name Untitled(Untitled.pynb). SQL (Structured Query Language) is the most common and widely used language for querying and defining data. Spark SQL functions as an extension to Apache Spark for processing structured data, using the familiar SQL syntax. Verify the kernel is ready. The kernel is ready when you see a hollow circle next to the kernel name in the notebook. Solid circle denotes that the kernel is busy. When you start the notebook for the first time, the kernel performs some tasks in the background. Wait for the kernel to be ready. Every time you run a query in Jupyter, your web browser window title shows a (Busy) status along with the notebook title. You also see a solid circle next to the PySpark text in the top-right corner. Run another query to see the data in hivesampletable. The screen shall refresh to show the query output. From the File menu on the notebook, select Close and Halt. Shutting down the notebook releases the cluster resources. HDInsight saves your data in Azure Storage or Azure Data Lake Storage, so you can safely delete a cluster when it is not in use. You are also charged for an HDInsight cluster, even when it is not in use. Since the charges for the cluster are many times more than the charges for storage, it makes economic sense to delete clusters when they are not in use. If you plan to work on the tutorial listed in Next steps immediately, you might want to keep the cluster. Switch back to the Azure portal, and select Delete. In this quickstart, you learned how to create an HDInsight Spark cluster and run a basic Spark SQL query. 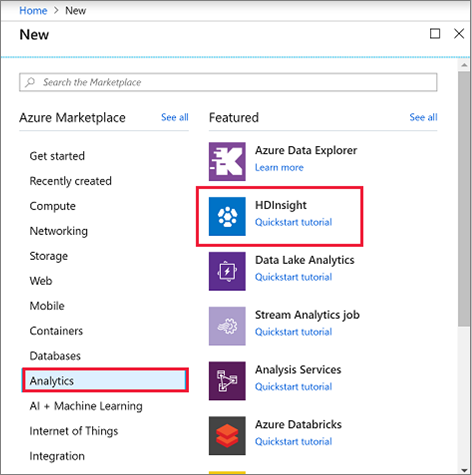 Advance to the next tutorial to learn how to use an HDInsight Spark cluster to run interactive queries on sample data.